Privateer Press is showing off a new Cygnaran warjack they've been working on. Say hello to the Dynamo. 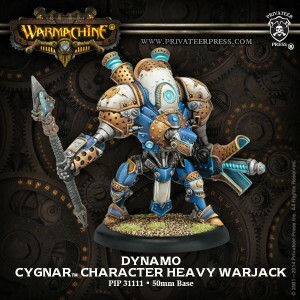 Dynamo is the most successful of Sebastian Nemo’s many prototype warjacks, the one that has survived extensive use in the field. Powered by its galvanic generator, Dynamo is outfitted to render electrical destruction via its devastating storm cannon. This weapon fires deadly bolts of lightning that can strike clusters of advancing soldiers, or concentrated to melt heavy armor to slag. Thanks to Dynamo’s ability to harness and channel its own kinetic energy, each attack it unleashes is more deadly than the last.